By the time you read this, Anna and I should be on a flight down to Costa Rica to celebrate a bit of a belated honeymoon. Though we were married at the end of September, the seasons in Central America are a little more congenial right now and it's much more exciting to be leaving frigid Boston for a tropical locale in February than October. That is, of course, assuming we get out ahead of Snowpocalypse... but, crossing fingers, it's looking good so far. I don't know much about the cuisine of Costa Rica... and this trip is more about beaches, rain forests, and volcanoes than food... but I will document the meals that I have and report back on anything that was especially interesting. Probably I will be eating lots of fish while Anna eats a lot of rice, beans, and plantains... but we shall see. 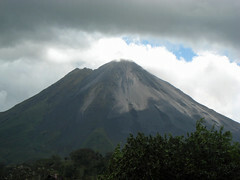 We have 5 nights at the beach (Playa Flamingo), three nights in the rain forest (Tenorio Volcano National Park), and then finish with 2 nights at the hot springs in Arenal. So assuming everything goes as planned, I'll be back in the States and back to blog posting somewhere towards the end of the week of 2/18.